Little Greene Zingara Wallpaper in Delft a beautiful wallpaper design to add a subtle hint of colour to your home this season. Firstly, this delightful wallpaper is part of Little Greene’s 20th Century collection. It is also a reproduction of a design dating back to the 1960s. 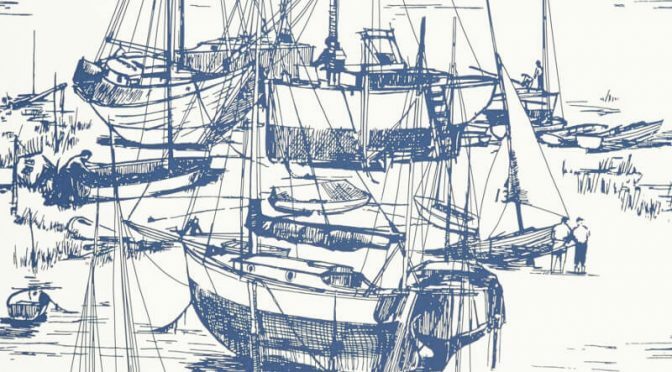 Featuring a harbour scape in a simple line drawing, it is true to the original design. This can be found in Manchester’s Whitworth Art Gallery. The Little Greene Zingara Wallpaper in Delft comes in a vibrant blue and white colour scheme which will transcend the seasons. Finally, use throughout a room for a dramatic look or as a feature wall. Complete the look with coordinating shades from the Little Greene paint collection.